It’s hard to find an industry or business today that is immune to the challenges skills gaps can pose. 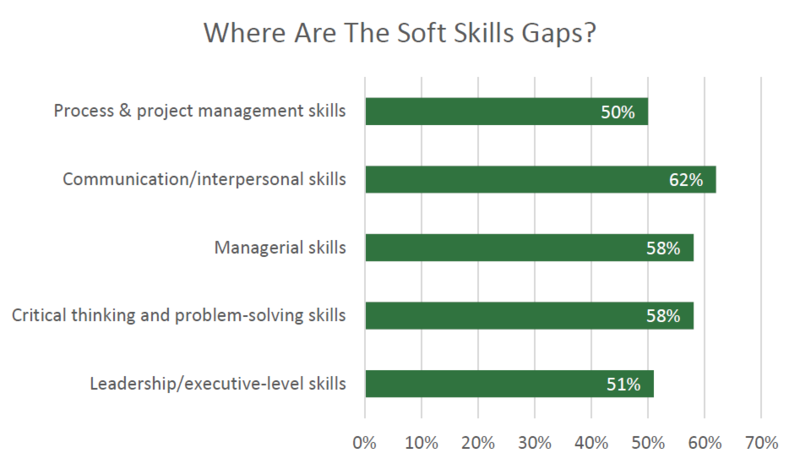 Yet while the effects can already be felt, most organizations are still only experiencing the early stages of many skills gaps. The resulting problems will only multiply as more and more Baby Boomers retire and a generation of subject matter expertise and institutional know-how walks out the door with them. To forestall — and ideally prevent — these gaps from dampening growth and dulling competitive advantages, talent development professionals play a key role within their companies. A study by Deloitte and The Manufacturing Institute showed that 94% of executives polled believed that personalized internal employee training could be used to successfully mitigate existing skills gaps. While just about every training technique will have a role to play in helping organizations manage and close skills gaps, one strategy, in particular, has generated more buzz than the others. Given the potential threats from both hard and soft skills gaps, corporate learning and development (L&D) professionals are finding microlearning to be a useful and effective strategy for closing these gaps within their organizations. Microlearning is a self-directed learning experience that delivers knowledge in short, focused, on-demand content segments. Why is microlearning so effective for closing skills gaps within organizations? This type of learning experience is known to produce immediate results that align with fast-paced industry changes, while also being very budget friendly. Shorter, compelling learning modules are also better at engaging employees with limited time for training. While typically associated with informal, just-in-time learning, microlearning can also be a part of a structured, formal learning experience — effective for closing gaps in both hard and soft skills. Microlearning can help employees improve non-technical skills including communication, flexibility, leadership, persuasion, problem solving and teamwork. Soft skills tend to be taught in days-long workshops where dozens of concepts are taught at once, which is not very effective. Employees are expected to return to work and change many behaviors. The newer trend of embedding bite-sized soft skills training in people’s everyday work is much more successful. Hard or technical skills are teachable abilities that can be defined and measured — these are skills that help companies maintain a competitive edge. In the past, microlearning has been deployed more often for just-in-time hard skills training. Employees access information when they need it, improving their ability to do something specific. Hard skills microlearning can be informal or formal. Whether employees search the company knowledge base for information or go through a certification with several microlearning modules, hard skills are also best retained when training is quick, timely and actionable. And building microlearning resources around hard skills can be as easy as arming your subject matter experts (SMEs) with tools that make it easy to record and share their knowledge. Microlearning content can exist in many forms, including video, live presentations (including internal “brown-bag” meetings), quizzes, games, discussions and more. Maximize understanding by breaking training down into short, digestible chunks. Keeping modules to less than 10 minutes can decrease the cognitive load and keep your training focused on one narrow concept. Avoiding including everything known about a subject. Strip down the training materials exclude any interesting-but-not-essential information that could distract from what you want someone to learn. Use and demonstrate real world examples that your employees can relate to. Aim to invoke their curiosity and get them thinking about a topic. This will help your employees retain knowledge more quickly. Make a strong impression through video, infographics, simulations, and demos. The form of your content should be more visual to increase engagement and improve retention of the information. Video, in particular, can be a very efficient way to create and curate microlearning content. Today’s video content management systems (video CMSs) enable trainers and subject matter experts to easily capture, produce and share knowledge in video, and for every employee to search those videos for relevant moments, then follow along step-by-step to successfully complete even the most complex processes and procedures. If you’re not interested in developing your training in-house, there are also plenty of options for pre-made microcourses from training content developers such as Grovo or Coursmos. Learn how one software company used Panopto’s video platform to support hard and soft skills training, helping it grow exponentially — download our corporate training case study.